If you only knew how long I sit around wondering where to hike, you’d laugh. I go through blogs. I open up my maps. I peruse my waterfall book. I can never decide. Maybe that’s because I have so many wonderful options? I knew I wanted a waterfall. That much was sure. This past Sunday my son and I set out for an off trail hike in Shenandoah to a big waterfall but due to my wonderful hydration bladder leaking and soaking my sweatshirt, we didn’t go. It would have made me very cold to hike with it like that and my base layer wasn’t warm enough. Ugh. We had fun roaming Big Meadows for a bit and driving Skyline. 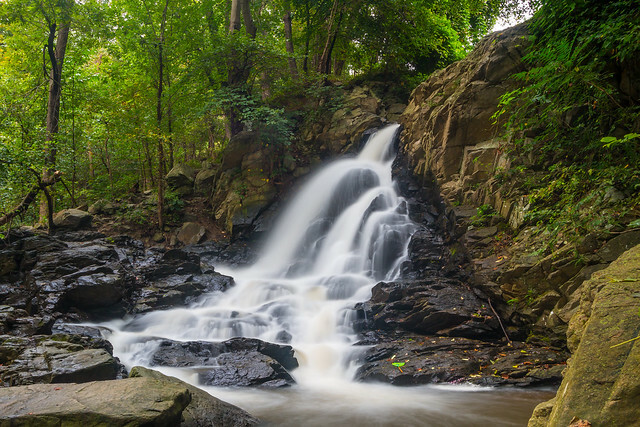 I needed something new so I decided on Kilgore Falls in Maryland. It would be a 2 hour drive but I figured that was better than 3 hours to other ones I considered. I slept poorly and almost scrapped the whole thing yesterday morning but I saw an inspiring post on Instagram so I dragged myself out of bed and went. As I was driving, I was willing the sun to stay behind the clouds. I felt like I had to hurry (I didn’t). I passed some beautiful farmland scenes that I would have liked to photograph but I really felt a need to get to the trail. I finally arrive and, boom, the trail doesn’t open until 10:00 am. 10:00 am? Really? That is so late. So crazy. I ran and used the port-a-potty (which I am happy to say was incredibly clean) and wondered what to do. 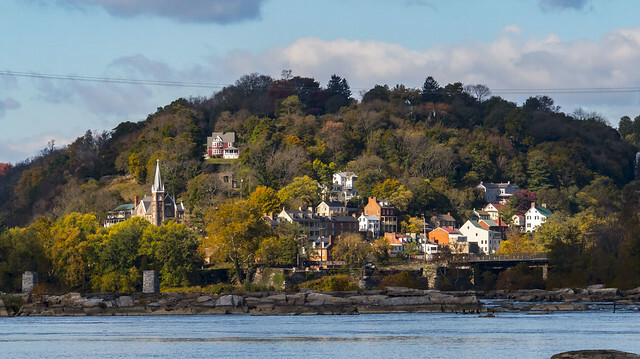 I decided to zip on over to Conowingo Dam. I have wanted to go for a long time and figured this was my chance. I didn’t know if I’d see any eagles but had nothing to lose. I got there and walked around a bit. I wasn’t seeing a lot of activity other than vultures. Whoopdedoo. I see those everyday around my house. And then I heard this sound. It was loud and sounded like birds could be fighting. Nope. Quite the opposite. It was two eagles getting it on (cue Marvin Gaye) on top of the electric tower. I obviously didn’t have my super telephoto lens with me but did have my 18-200mm. I zoomed in as best as I could to grab a photo. I was quite amused. When they were done, they just sat there. I guess they were being in the moment of what just took place. I figured this was a good time to head back to the trail head. Hooray it was open! I was a bit worried about the number of cars I saw and thought there might be too many people for good photos. Thankfully, they were no where to be found except for one photographer. Walter. I thought he was packing up to go but he was interested in getting to the other side of the creek where the best photos would be. The water wasn’t super deep but it would be cold. We were both interested in avoiding that. So we walked. And walked. We followed the creek for quite a ways to see if there was a better place to cross over. Nope. It just got deeper. Like to my thighs deep. We turned around and walked back to where we started. I finally got the courage to walk up along the side of the big boulder and did get my feet wet. I thought, “I can do this!” so I walked out a bit more for a better photo. I turned and walked back and Walter decided to go. We ended up getting photos of each other in the process which was cool. As I stood there waiting, two young adults walked up and just walked across the creek without hesitation. I had to laugh. Youth. Never afraid. Bold. And it was then I knew I was walking across too. So when Walter returned we made our way across the creek. It wasn’t so bad. Cold, yes. But worth it. The other side of the waterfall was beautiful and made for great photos. The things we do for photos…. It ended up being a great way to spend New Year’s Day. I met a great photographer (go see his work). We had fun. I saw eagles mating. I often lament that there are not that many waterfalls closer to me. 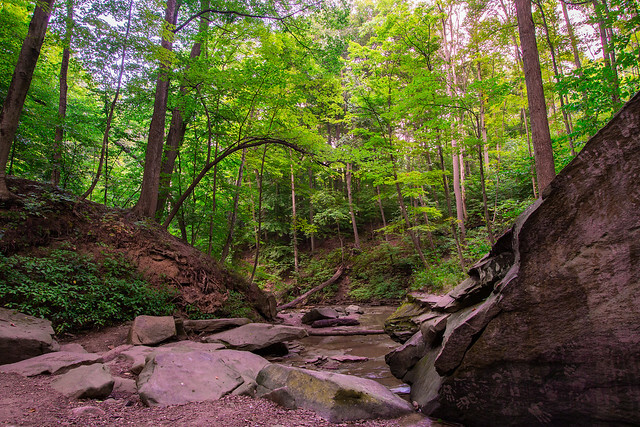 Sure, there is Scott’s Run Nature Preserve and that is a really cool one. 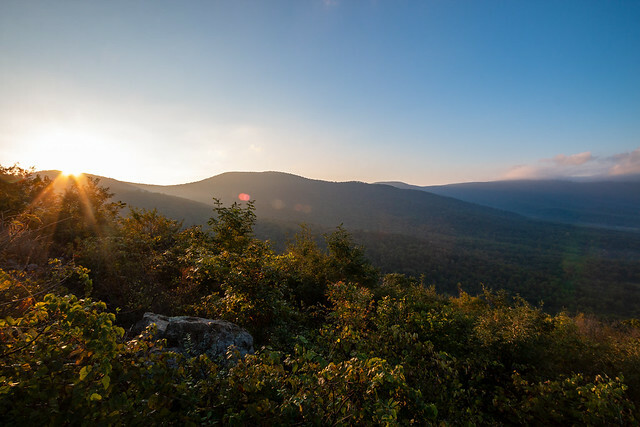 And of course, all of the ones in Shenandoah National Park and along the Blue Ridge Parkway. I just really wish I lived right next to one I guess. 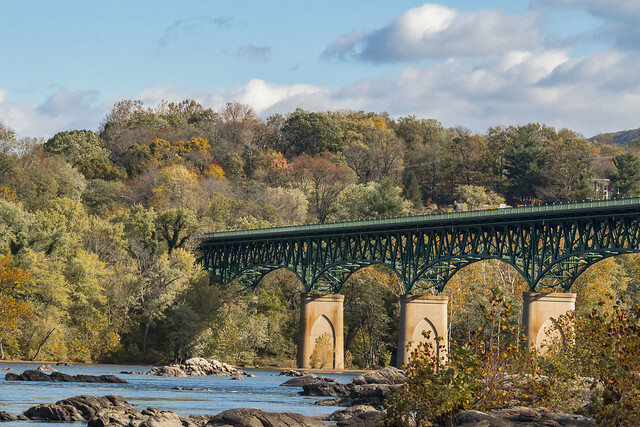 However, Potomac Wayside Park is only 30 minutes away. I feel like calling this a “park” is a bit of a stretch. The first thing to know about this park is that there is parking for about three vehicles. That’s it. When you drive up to it, there is a large, long paved area but they (Loudoun County? NOVA Parks?) call most of it a roadway. And they don’t allow parking there except for the very end of it. If you decide to go, go early (no later than 9:00 am). It is unfortunate that there is so little parking because the area is beautiful. If you go during the summer, you’ll see that the Harpers Ferry Adventure Center uses the full length of the “roadway” to park for their tubing expeditions. I know, it seems unfair that they get to use it for commercial ventures while the rest of us cannot. When you arrive… very early in the morning…you’ll see a sign at the start of the trail. The trail is incredibly short and it will take you directly to the waterfall. Each time I have been to the falls there has been a good amount of water. 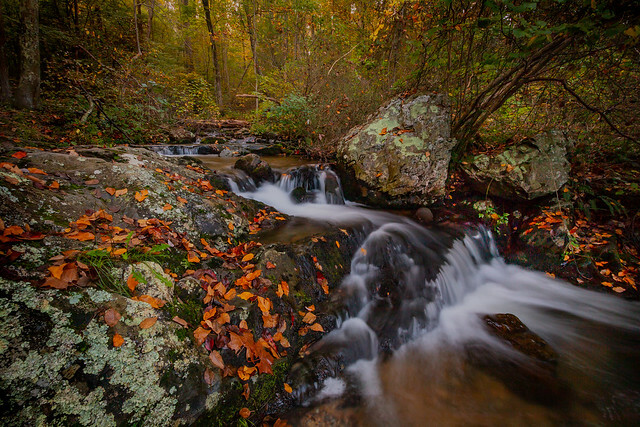 The name of the waterfall is Piney Run Falls. It dumps directly into the Potomac. I once visited during the winter and it was pretty much frozen solid. It looked amazing. There are some large rocks to climb on but just be aware that they are very slippery. On a hot day, feel free to wade into the water. It feels amazing. 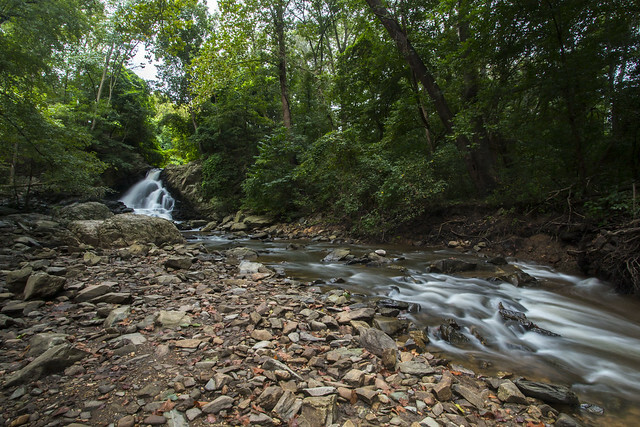 If you continue down the trail, you’ll come to the Potomac River. From there, you’ll have a great view of the bridge that connects Maryland and Virginia to your right. And to your left, you’ll see Harpers Ferry. I suppose you could fish from this area. I would recommend swimming here as the current can be strong. The chances of seeing an eagle fly by are very high. When the water is lower, there are exposed rocks where you can sit and relax. 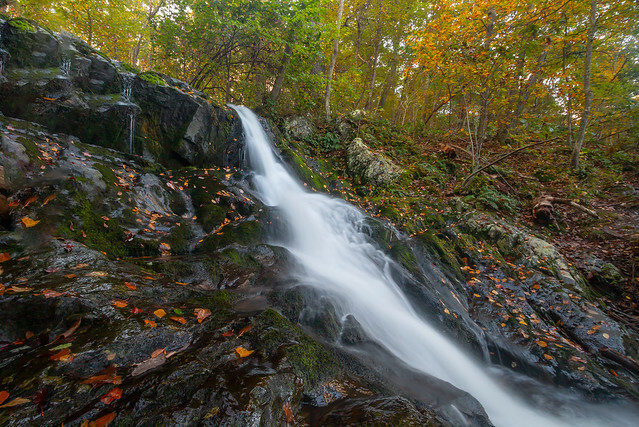 This is one of my favorite spots in Loudoun County. Because I go very early, I have it to myself each time. While it is a shame the parking lot is so small, I guess, it is also a blessing. It would probably be overrun with people if it was larger. It is a balance. I definitely recommend visiting Harpers Ferry after seeing the falls. There are a number of smaller trails to explore. Or you can do the Maryland Heights Trail which will give you an incredible view of the entire area. This past weekend I drove up to Michigan for two reasons: 1 – to celebrate my parent’s 60th wedding anniversary with our whole family and 2 – to pick up my kids. My daughter has been with them for 2 weeks and my son for 1. Because it is a long drive, I like to break up the trip going there. So I headed out Friday afternoon and had plans to meet a friend. Our original intent was to hiking to a couple of waterfalls. 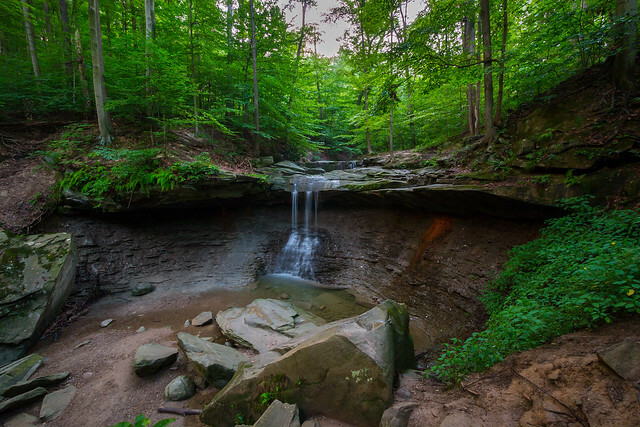 She lives right next to Cuyahoga Valley National Park and I had found a couple of short hikes. While I was driving, though, it stormed. Bad. I drove through multiple downpours where I could barely see. We changed plans and decided to go to dinner. Thankfully, by the time dinner was done, the sun was more or less shining and she suggested we try for at least one waterfall. We grabbed my camera equipment from the hotel and drove the whole 6-7 mins to the trailhead. We chose Blue Hen Falls for our waterfall. It was already 8:00 pm so we didn’t have a lot of time. We drove down the small drive to the parking lot and hopped out for the 1/6th of a mile walk. The trail, while, short, was so pretty. And then it opened up and there were the falls. We were both wowed by their beauty. While I was taking photos, the sky turned a beautiful pink color (in fact, you can tell in my photos – everything had a pink glow). I wish the pink sky could have come through in the photos because it was so pretty. I didn’t even need to attach a filter to my camera. In fact, it was almost too dark. I was able to shoot for 10 seconds or more for my shots which was really nice. Thanks to the thunderstorms that moved through earlier, there was just enough water for a pretty shot but not so much that I had to get wet for the close ups. My friend mentioned there had hardly been any rain lately so the creek bed was very low. I really didn’t want to leave. I could imagine getting there very early in the morning and having beautiful light. Alas, I will have to save that for another time. We didn’t have flashlights or anything so we returned to our cars. I was so happy to have that time with my friend and be able to visit a beautiful waterfall. 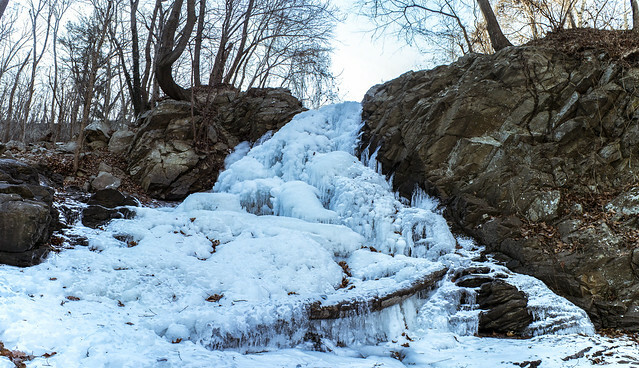 If you’d like to visit Blue Hen Falls I would recommend visiting this link on The Outbound. They have the parking area marked. 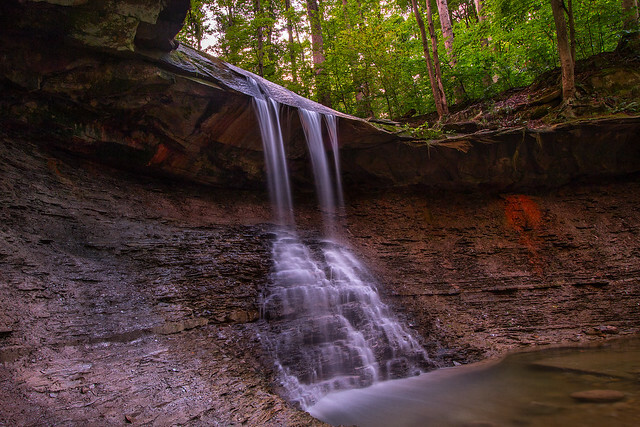 This waterfall is approximately 10 mins from the Ohio Turnpike so if you are traveling along that route, you could visit the falls, have lunch there, and then continue on your way. It wouldn’t take any time at all.